We have organized our 2001 expedition to Minya Konka individually. On this page, we would like to give some of the experiences that we made there, and give information about the mountain and the route. All information given here is based on our - subjective - experience or give details ouf our trip planning. Mentioning hotels etc. here is not based on any detailled comparison, there may be cheaper or better alternatives. Some details about the visa cover the procedure for German citizens and might be different for other nationalities. Most nationalities need a visa to visit the People's Republic of China. For groups, the visa is usually organized by the travel agency. For individual travelers, things become more complicated. The Chinese organization taking care of us (SMA, see below, organization) issued an invitation, with which we then applied for a visa. The visa wouldn't be very expensive - 60 DM - but the problem is that one must appliy for it personally - at the corresponding Chinese consulate. Since we are living in Baden-Württemberg, for us this is not the Munich office (200 km distance), but the office of the embassy in Bonn, 500 km far away. The consulates generally deny any visa from persons outside their consular district. So, a visa application in Bonn would cost us an extra holiday. Fortunately, there is another way out: The visa must be applied for personally, but no matter by whom. Correspondingly, there are visa services which do the visits to the embassy and the office work. The visa then is about twice the "orginal" price. We had the Visa-Dienst Bonn to get our visa. More information about the visa regulations can be found at e.g. the Chinese Embassy in Germany. The abundant Chinese dialects which I will further simplify as "the Chinese" here are fundamentally different from Germanic-Romanic languages and even different from almost all other languages in the world. The Chinese is a syllable language, there is no conjugation or declination. Subject and object are simply defined by their position in the sentence, tenses by attached syllables. One or more syllables form a word. The writing has a letter for each syllable. If one doesn't know how a specific syllable is written, this cannot be concluded. Therefore the Chinese have to learn a lot more "letters" than we do. The pronunciation of the syllables decisively contributes to their meaning. There are five different ways of pronunciation - rising, falling, high, low, neutral - which give completely different meanings to a syllable with the same "spelling". Each of them also has a different letter in writing. The melody of the sentence, however, is completely secondary. Correspondingly strange is the impression of Chinese language for our hearing. A transcription to latin letters exists, but outside the big cities one would only find Chinese letters. The combination of several letters to logic units (which we would interpret as words) is not unique. Partially, also the numbers are still written as Chinese letters. So, a foreigner should be ready to know some letters (entrance, exit...) and have corresponding literature at hand..
As we encounter difficulties with the completely different structure of the Chinese language, the Chinese have problems with other languages. Meanwhile all Chinese pupils are learning English, but we found only few Chinese with whom an English conversation in complete sentences was possible. There are no foreign words in Chinese, because everything must be expressed in a predefined set of basic syllables. For example, "telephone" is therefore "speak electricity". Consequently, the western visitor cannot recognize anything, because there are no similarities in pronunciation at all. Practically no Beijing taxi driver seems to know the English word "airport". The Lonely Planet "China" which we had with us was quite useful for the cities. I will only give additional information or corrections here, since I don't intend to publish a Beijing tourist guide. There is a bus from the airport to the city, fare Y 16. Bus number 1 goes to the central city via Dongzhimenwai Dajie, Chaoyangmennan Dajie and then from east to west via Jianguomennei Dajie/Fuxingmennei Dajie, crossing Tiananmen square. A taxi from the airport to the center costs at least Y 70. Hotels: Hotel rooms are rather expensive in Beijing. We had looked around in the internet and soon found reasonable accomodation at Sinohotel. On our arrival we chose the Airport Garden Hotel because it is situated close to the airport and we had to continue with a morning flight; the three days at the end of our trip we chose the Fangyuan Binguan which is situated in the very center, nevertheless being affordable. Where people go for a stroll - the pedestrian zone with shopping centers, restaurants and souvenir shops in the very center. The Y 40 entrance fee to the Forbidden City (officially: "Palace Museum") are a good investment. Although the buildings are rather similar in style and the furniture is quite spartan in most rooms, the whole arrangement is really impressive. The German language tape guide for Y 30 rental fee is very professional and worthwile, I would expect the same for other languages. The Gate of Heavenly Peace (Tiananmen) is the southern entrance of the Forbidden City. On the other side follows Tiananmen Square with the "Maosoleum", and the southern boundary of the square is Qianmen, the former city gate. The Heaven Temple is unfortunately quite expensive (Y 35). We had only the cheaper ticket without admission to the buildings, but with more comfortable weather one surely can spend a long time there, visiting everything thoroughly. We chose the easiest way and went to Badaling with a tourist bus from Qianmen. The alternatives described in the Lonely Planet are maybe more quiet if one has enough time; even in Badaling, it was no problem to find a quiet section of the wall, beyond the tourist masses. Walking to and from that quiet section through the touristic wall, however, completely filled our time at Badaling. The Wall at Badaling costs Y 46 entrance fee, the bus trip from Beijing (round trip) Y 50. On the way back, the buses stop at the Ming tombs, which was not of very big interest to us (considering another Y 45 entrance fee). Chengdu is of comparable size like Beijing, but a little more confusing. The weather here is mostly hazy. The Carrefour supermarket is situated close to Dongchenggen Jie, where the Lonely Planet indicates the "No 3 Hospital" (Nr. 28). Attractions (subjective choice) - more see for example Lonely Planet "China". Quite nice temple aree in the northeast outside the city, vegetarian restaurant. Temples in the city, easily reachable on foot. We have organized our expedition from and to Chengdu via Sichuan Mountaineering Association (SMA). This means, from Chengdu on an interpreter will be in charge of us, we will be transported to the mountain and brought back at a pre-defined date. Included are climbing permit, transportation, hotels in Chengdu and on the way, food supplies for the Chinese (interpreter and liaison officer), but not our food in the base camp. It would have been considerably more expensive to have kitchen service at the base camp, and anyway that wouldn't be of any use for us. The Chinese consider the lamasery Gongga Gompa as the base camp, while our proper base camp is situated one day walk closer to the mountain. The logistics has worked as defined in the contract, there were no additional costs. The general attitude of our Chinese team in charge must be characterized as rather unflexible. Unlike in countries with tourism tradition like Nepal or also Europe, people in China are polite to foreigners, but we could not feel any interest in building up or maintaining a positive image. Things that was paid for are done, but a somewhat addiction to the work is hardly developed. Without an interpreter, one is lost in China without a good knowledge of Chinese language. Our interpreter - English student in the second year - made a good effort to do her work well. It turned out, however, that she did not (or not completely) understand many of our questions concerning specific things which might have been beyond some standard situations. Unfortunately we never got any feedback about these misunderstandings. As a result, we often received contradictory answers to similar questions which then - very late - did let us conclude that something wasn't understood. A simple "yes" or "no" obviously came quickly even after questions that were not understood. Also due to these problems, unfortunately we couldn't learn much about the geographical and cultural backgrounds of the region we visited, although we really had liked to do so. What can be bought in Chengdu? Besides our flight baggage, this time we had sent ahead 50 kg to Chengdu by air cargo, mainly mountaineering equipment and high camp food. We took care not to send too important things by cargo, so the expedition could still be made if the cargo would have got lost, although with some limitations. We could have bought some of the things that we had sent to China, others are not available. In Chengdu there is a supermarket of the French Carrefour chain, but the supplies are strongy oriented to the Chinese market. For the "normal" food, it was generally hard to see how spicy it is. The dried noodle dishes, only labeled in Chinese, were a desaster for our taste. Moderate instant dishes or instant soups - we had some from Germany with us, e.g. noodles and smashed potato dishes, to be prepared with boiling water, and instant smashed potatoes with milk included. We did not use special high camp food. Gas cartouches are available in Chengdu, as our Magdeburg colleagues have found out. Like on most of our expeditions, we decided to use a liquid (car) gas stove, because the fuel is availabe everywhere. In Kangding we bought two five-liter canisters at the gas station. Since we had few stays at the hight camps and seldomly had to melt snow, our needs were lower than expected - we spent only three liters in the four weeks. Looking at a reasonably detailed map of Asia, one must be astonished about this one single eastmost 7000 m peak, about thousand kilometers east of the other high mountains. It is situated in the Chinese province of Sichuan, therefore the Minya Konka (or Gongga Shan, Tibetan resp. Chinese name) is the highest mountain of "original" China (without autonomous regions), 7556 m high. Minya Konka is the world's 66th-highest mountain. Minya Konka, pencil drawing by Eduard Imhof, 1930. Find more about the works of E. Imhof in the virtual library 'Eduard Imhof - cartographer and artist' at the ETH Zürich. Although completely situated in Sichuan, the Minya Konka marks a cultural and topgraphical boundary between China/Sichuan with a humid moderate climate in the east and (climatically and culturally) Tibetan influenced dry highlands in the west. Minya Konka was intensetly surveyed and explored in the 1930s. 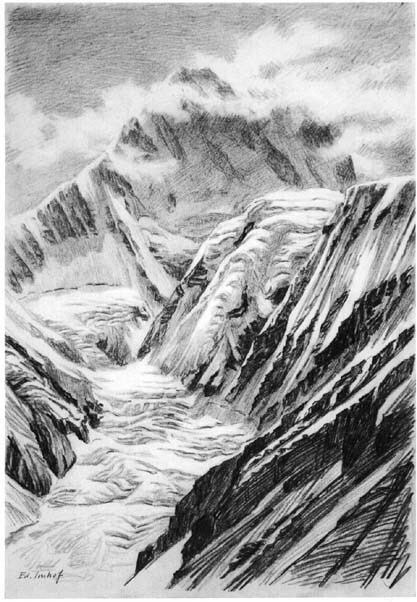 A very nice representation is the 1930 pencil drawing by Eduard Imhof, showing the mountain from the southwest; from the left, northwest ridge is rising towards the summit. At the date of its first ascent, Minya Konka was the second highest mountain ever climbed. Kamet (7756 m) was climbed in 1931. These data are based on the books mentioned below and on personal communication of several expedition participants. They probably are complete as far as successful climbs are concerned, the unsuccessful climbs are probably more than listed here. 1980 American expedition, one member is killed by an avalanche at the rock band at 5000 m. 1989(?) French expedition, attempting the central pillar to the NW ridge. Bad weather and injury of a member force a retreat. 2000 Italian expedition comes until 6000 m in spring after many bad weather days. 2001 Claudia and Hartmut reach only 5350 m, forced back by bad weather in spring. 2001 Magdeburg expedition reaches 5800 m in May, then forced back by bad weather. Until 2001, the mountain was climbed six times. 18 persons have reached the summit. 15 climbers did not return from Minya Konka. All successful expeditions reached the summit via the northwest ridge. The ridge is usually reached from the southwest, where the ridge rests on three large pillars. Most expedition used the left pillar, but also the central pillar was climbed. Up to the lamasery Gongga Gompa (3741 m), loads can be transported on horses or yaks. The real basecamp at the base of the mountain is a day walk from there through a lot of scree. One follows the northern moraine of the glacier in a small depression. Our base camp was situated at 4380 m, there is plenty of space. The camp sites on the way to the summit are clearly defined by the natural circumstances. Camp 1 is situated on the snowy saddle of the left pillar, behind the big rocky structure ("pyramid") at 5310 m. There is not much space here, it is a lot of work to to build a platform in the snow. The route from the base camp first follows moraine scree towards a basin at 4800-4900 m, where an intermediate camp can be installed. A rocky step (I-II) gives access to a snow couloir which leads up to the pillar to the left side. In lower part of the couloir, there is considerable avalanche danger. It is not too steep (35-40°). The pillar is reached ten minutes below camp 1. Camp 2 is situated on the northwest ridge where the pillar meets the ridge, at about 6000 m. From camp 1 the route mainly consists of icy passages up to 45° which consisted of hard ice during our attempt. There are also many crevasses in this section. From camp 2, the route follows the northwest ridge, which first is easy. 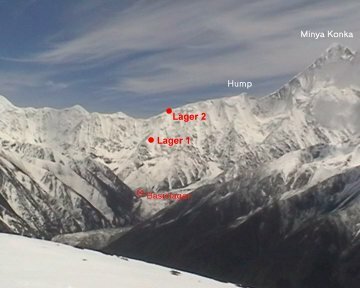 At 6300 m the ridge has a striking rise, the "hump" or "camelback". The very narrow hump must be climbed over, and on the other side, very exposed and 100 m lower, one reaches a pass. For the way back, the hump must be equipped with fixed ropes. Beyond the pass, the ridge consists of snow and ice again, slowly becoming steeper. The last spot for a tent is at about 6800 m. Further up the ridge becomes steeper and partially rocky, not extremely difficult but very exposed. The wind up here is also a serious problem, since the upper part of Minya Konka stands completely free, being exposed to severe altitude storms. From camp 2 to the summit, a camp can be installed before the hump, in the saddle, or at 6800 m, depending on the situation. Chengdu - Ya'an - Kangding: Mostly a good road, until Ya'an excellent expressway (130 km), then about 200 km reasonable paved road. Time: about 6-7 hours (plus lunch break). Kangding (2500 m) - Shade - Liuba (3860 m): First a paved road over a 4300 m pass (this is the road to Tibet), then about 100 km rather bad road, usually possible with normal vehicles. About 6 hours. Liuba (3860 m) - Zimei La (4560 m) - Zimei (3480 m): From Liuba, there is an ascent (on foot) of 700 m to Zimei La and 1000 m down again to Zimei. The village Zimei consists of only a couple of houses. Zimei (3480 m) - Gongga Gompa (3741 m): 150 meters down to the bridge over the river, then up 500 meters on mostly a good trail through a forest to the lamasery. This book is unfortunately our of stock. But who can get it, should definitely do so. The first climbers describe their adventures during the (several months of) travel to the mountain, the reconnaissance and first surveying of the area and their climb on the northwest ridge in a language which is far beyond the vocabulary of today's high mountain publications. A great piece of alpine history, this is one of the best mountaineering books I ever read. My book for the lonely island. A Chinese union team conquers Minya Konka; by several accidents, four members lose their lives. In the early days celebrated as the "real first climb", meanwhile both climbs are commonly accepted. Astonishingly, the English translation appears stylistically better than  (but this shall be my personal comment). The adventures of an American expedition who does the third climb in 1982. As a work of literature not comparable to , since more sensationally oriented, trivial in language and in the pictures partially wrong (Avalanche Alley is wrong). I have not read this one, since I had no opportunity to do so before the expedition. Therefore I quote it here for completeness only.